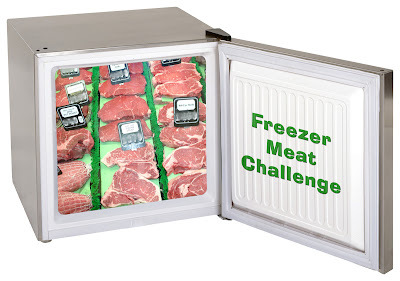 I think you did awesome with your Freezer meat challenge! With the pork shoulder you have left, I would make pulled pork sammies. I haven't been feeling it, either. We need some inspiration! Hope the cake turns out okay! I am impressed with Johnnies artistic creativity! Oh, I LOVE the plating! I've tried - and attempted to try - Amy's Organic frozen meals a few times. The enchiladas are really good. Every time I think I want one of those meals though, all I have to do to motivate myself to cook is flip the box over and look at the nutritional facts. So much saturated fat and sodium!! Some of the percentages are outrageous. I sort of feel like they give organic a bad name...and that goes to show that just because food is organic, it's not necessarily healthier. What a bummer.